Are 4300 TEPCO workers DEAD while Fukushima radiation spreads around the world starting a mutant world apocalypse? With reports that TEPCO hired incompetent workers to build water storage tanks, could TEPCO have also caused thousands of deaths of cleanup workers? This idea came up in my news reader, so I want to check its validity. It talked about 4,300 TEPCO workers dead. It's pretty outrageous that TEPCO would use subpar workers to build the water tanks that are supposed to be keeping radioactive water out of the ocean. But it would really be extremely outrageous if TEPCO's inadequacy had let thousands of workers die. Unless you want to spin these workers as hero's who sacrificed themselves to clean up something that was going to harm the rest of us. The cleanup workers are Chernobyl were presented as hero's. This gives us some supposed evidence to try and validate. By the way, the site this is on is full of raving lunatic conspiracy theory gunk such as the "MILITARY AND CIA STATED THEIR SUPPORT FOR THE REPUBLIC" and we should expect MASSIVE ARRESTS starting any day now. So we can't expect too much in the way of accuracy. So if the Military & CIA are in support of the Republic, well, that's their constitutional duty, and if they hadn't done so they would be derelict of duty and perhaps treasonous. But, we can't get distracted, what about these TEPCO workers? I did some yahoogling and -- actually -- there were dozens of blogs, all with raving lunatic conspiracy theory blog names -- with very similar titles. One wonders whether there's some black hat SEO tricks going on here? Anyway, I did finally get to some real news. This was a news report published in the couple days after the earthquake and tsunami. Engineers were in the middle of their mad dash to avoid nuclear catastrophe at the Fukushima nuclear power plant. There had already been large radiation releases into the vicinity. The Japanese government had declared a 20 kilometer evacuation zone around the power plant. About 140,000 people living in the 20-30 kilometer zone were told to stay in their homes. At the same time, the U.S. Government ordered all Americans to stay at least 80 kilometers from the Fukushima plant. That is one of the side controversies to the whole thing - why did the U.S. government order such a large evacuation zone, and the Japanese order a smaller one. Well, there is an issue of where would they find the space to store another 140,000 refugees. More than 4,300 people are listed as dead but it is feared the total death toll from the catastrophe, which pulverised the country's north-east coast, will rise substantially. That's "people" not "workers"... There's a difference between those two words, people. The claim of 4,300 dead workers implies something like - lots of people sent in to the site to do cleanup work, got radiation poisoning, died. But this - 4,300 people - that's just the casualties, and probably aren't radiation casualties at all but from the earthquake and subsequent flooding. Here's an actual tragedy, published by a regular news outlet, involving 4,300 people that actually died at the hands of their own government. This is something actual and real to be actually outraged about. TEPCO said a male worker in his 50s became ill during a meeting Wednesday morning, before his shift started. He was taken to a hospital immediately, and died the next morning. "We can't disclose what was cited as the cause on his death certificate because it would amount to violation of privacy," a TEPCO spokesman said. I'm not satisfied by that explanation. However, 3 workers dead is a far cry from 4,300. We have 4,297 worker deaths to go. That's three workers -- two of whom were hospitalized with radiation burns. Those two were wearing regular shoes, while the third was wearing boots and didn't get burned by radiation. The three were standing in a pool of radioactive water, and the water seeped through their protective clothing. More people have now died because of the Fukushima evacuation process than were killed in the region by the 2011 Japanese earthquake and tsunami which caused the displacement, a survey said. Some 300,000 people evacuated their homes in the prefecture after the disaster caused multiple meltdowns at the Fukushima Daiichi nuclear plant, according to Red Cross figures. A survey by popular Japanese newspaper Mainichi Shimbun said Monday that deaths relating to this displacement – around 1,600 – have surpassed the number killed in the region in the original disaster. Close to 16,000 people were killed across Japan as a direct result of the earthquake and tsunami in 2011. According to the Mainichi report, 1,599 of these deaths were in the Fukushima Prefecture. (4.0± 1.4 Bq kg−1) and elevated137Cs (6.3± 1.5 Bq kg-1) in 15 Paciﬁc blueﬁn tuna sampled in August 2011. This paper goes into more detail, but that measurement of radiation is key. The amount, 6.3 Bq per Kg is significantly higher than pre-Fukushima levels, yes. HOWEVER, it is an insignificant amount of radiation. It means that, yes, Bluefin Tuna is carrying radiation from Japan to the West Coast faster than ocean currents do the job. But the resulting Cesium content is miniscule. These fish were caught off San Diego in August 2011. The Chernobyl disaster (Ukrainian: Чорнобильська катастрофа, Chornobylska Katastrofa -- Chornobyl Catastrophe) was a catastrophic nuclear accident that occurred on 26 April 1986 at the Chernobyl Nuclear Power Plant in Ukraine (then officially Ukrainian SSR), which was under the direct jurisdiction of the central authorities of the Soviet Union. An explosion and fire released large quantities of radioactive particles into the atmosphere, which spread over much of Western USSR and Europe. The Chernobyl disaster is widely considered to have been the worst nuclear power plant accident in history, and is one of only two classified as a level 7 event on the International Nuclear Event Scale (the other being the Fukushima Daiichi nuclear disaster in 2011). The battle to contain the contamination and avert a greater catastrophe ultimately involved over 500,000 workers and cost an estimated 18 billion rubles. The official Soviet casualty count of 31 deaths has been disputed, and long-term effects such as cancers and deformities are still being accounted for. What's it like inside the zone around the Chernobyl accident? This documentary takes a trip to the actual sites, and shows radiation readings using a geiger counter. Trips are fairly easy to arrange, through a company called Solo-East, and travelers don't even have to wear special equipment. The film-maker even meets with some "resettlers" who have moved back to land near the Chernobyl reactor complex. They also take a trip to Pripyat, the city near the reactor site that was primarily for workers at the plant. It is an abandoned city where nature is taking it back. Inside Chernobyl - Directors Cut (2012) from Adrian Musto on Vimeo. Sea floor littered with dead animals? No. Starfish Wasting due to radiation? No. One of the ideas being floated around is that the "Sea Floor is Littered with the Carcasses of Dead Sea Animals" who died from radiation from the Fukushima disaster. The stories have all looked to be too far gone into la-la-land for me to even note them here. A related story is about Starfish Wasting Syndrome, where lots of starfish are dying on both the East and West coasts of the US, which many are also blaming on radiation from Fukushima, but the only evidence I could find was that it's some kind of disease and that large scale starfish die-off's have occurred in the past. Over on Deap Sea News they've written up debunkings of both stories. Is the sea floor littered with dead animals due to radiation? No. - According to DSN - the author of the DSN post had formerly worked at the Monterey Bay Aquarium Research Institute (MBARI), the institution which supposedly published the source paper behind the story - MBARI has published no paper describing anything of the sort. MBARI did publish a study titled Energetics of life on the deep seafloor studying the patterns of phytoplankton blooms near Monterey Bay. Another paper is Smith, K. L., H. A. Ruhl, M. Kahru, C. L. Huffard, and A. D. Sherman. (2013). Deep ocean communities impacted by changing climate over 24 y in the abyssal northeast Pacific Ocean. Proceedings of the National Academy of Sciences, www.pnas.org/cgi/doi/10.1073/pnas.1315447110. Between them DSN says the research focuses on phytoplankton and diatom (tiny sea animals) that have been blooming since 2002, who live then die and their bodies sink to the ocean floor. In the deep ocean other animals exist to eat those dead bodies. It's described as "marine snow" and is a naturally occurring thing, that began well before the Fukushima event. Now, DSN also discounts the idea that the Ocean Is Dying (because of Fukushima). I wonder what DSN would say to this presentation by Jeremy Jackson, Ocean Apocalypse, he gave recently at the Naval War College in which he said the Ocean is Dying. In Jackson's telling, rising ocean temperatures, overfishing, pollution, and other effects are causing massive shifts in the mix of animals and plants in the oceans. The big sea animals are almost all gone, and what's taking place of the once vibrant sea life is slime. In other words, a half billion years of evolution of sealife is being erased from the ocean. The kicker? It has nothing to do with Fukushima and has everything to do with other poisons. Starfish Wasting Disease/Syndrome (SWD/SWS) pre-Dates Fukushima by 3 to 15 years. This is probably the most self-evident of reasons. One of the earliest accounts of starfish wasting disease was recorded from Southern California (Channel Islands) in 1997 (pdf). The account of SWS in British Columbia was first documented by Bates et al. in 2009, and their data was collected in 2008. Fukushima? March 2011. Starfish Wasting Syndrome Occurs on the East Coast as well as the Pacific. Many of the accounts alleging a Fukushima connection to Starfish Wasting Syndrome forget that there are also accounts of SWS on the east coast of the United States affecting the asteriid Asterias rubens. There is no evidence (or apparent mechanism) for Fukushima radiation to have reached the east coast and therefore the Fukushima idea is again not supported. No other life in these regions seems to have been affected. If we watch the original British Columbia Pycnopodia die-off videos, and the later Washington state die-off vidoes, one cannot help but notice that other than the starfish, EVERYTHING else remains alive. Fish. Seaweed, encrusting animals. etc. This is a followup to an earlier post where I went over a video showing elevated radioactivity at a beach near San Francisco. New information now available is showing that the radiation came from naturally occurring thorium and radon. This video reads through an article posted on the Half Moon Bay Patch. Basically, the person who did the earlier video didn't do any analysis. He walked around and noted some numbers - but the numbers could be any kind of radiation. That is - a Count on a Geiger Counter is simply the thingy noting a radioactive particle was picked up by the Counter. It doesn't tell you the source of that particle. And it's the source of the particle which determines how risky it is. At least that's my half-assed understanding at this time. Note that all the peaks are different isotopes of Thorium and Radium. This is a clear sign the material is naturally occurring. This image is a sample taken from a "deck" in Fukushima Prefecture, and clearly shows peaks for Cesium-137. Remember that Cesium-137 is not naturally occurring, and is wholly a byproduct of the Nuclear Age. 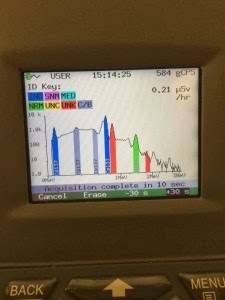 This video was recorded by someone who was more careful in reporting radiation readings on beaches between Half Moon Bay and San Francisco. 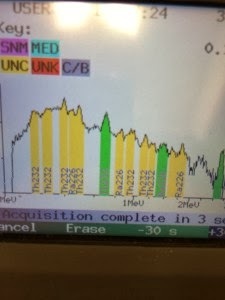 He clearly correlated the radiation readings to the presence (or not) of "dark sand", and concludes that this is naturally occurring radiation.